The OSAC Fire and Explosion Investigation Subcommittee has proposed that the National Fire Protection Association (NFPA) develop the Standard for the Organization and Operation of Fire Investigation Units. The proposal has been evaluated by staff and the public comment period is now open. The Fire and Explosion Investigation community has been fortunate to have NFPA 921, Guide for Fire and Explosion Investigation, and NFPA 1033, Standard for Professional Qualifications for Fire Investigator, for many years. These consensus documents form the basis for practice in the field and support certification programs for fire and explosion investigators. The field has not had a standard for Fire and Explosion Investigation Units (FIU) that is suitable for accreditation of FIUs. The proposed standard will include requirements for organization, facilities and equipment, compliance with safety procedures, training, certification and education, origin and cause report content, document retention, review and approvals of investigation reports, and processes and management systems. The document will be suitable to support and provide a path to accreditation of fire and explosion investigation units. This is an important step toward fulfilling the recommendation in the 2009 report from the National Academy of Sciences that all forensic work to be carried out by accredited organizations. In April 2015 the National Commission on Forensic Science echoed this call for universal accreditation of forensic science service providers, including fire investigation units. OSAC looks forward to working with NFPA to develop this important building block for fire and explosion investigation practice. Read page two of Volume 21, Number 9 of NFPA News for more information. As my term as FSSB Chair comes to a close, I would like to extend my sincere appreciation to all the OSAC members and affiliates who have dedicated countless hours of work to the OSAC mission for the last three years. It has been an amazing and humbling experience to chair the FSSB and participate in the work of OSAC. I have watched OSAC mature over the last three years from a great concept on paper to full operations with more than 600 members and affiliates actively working on more than 200 projects. I will always remember the very first FSSB meeting at NIST. The room was alive with energy, but no one was quite sure where to direct it quite yet. The first full meeting of OSAC in Norman, OK was quite the same. Over the years, I have witnessed all the moving parts of OSAC find their rhythm. Each full OSAC meeting seems to go more smoothly than the last, and at this time we are looking down the pipeline and starting to see a deluge of work products headed our way! All of this took time and an extraordinary amount of effort from volunteers, nearly all of which have full-time day jobs. It took time for the QIC to develop the processes, time for the OSAC subcommittees to prioritize work, time for the stakeholders and Resource Committees to engage in feedback, and time for many standards to go to SDOs and return to OSAC. Despite my very naïve (mis)understandings of the process at the beginning, I now fully understand what NIST meant when they advised us that the standards process would take a while. All of that is to say - OSAC has achieved several significant results over the last three years, but I believe that it is poised to deliver so many more now that the processes are in place, and everyone has a better understanding of how their own committees function most effectively. The membership as well as the leadership have learned and grown over the last three years, and I’m excited about the future of OSAC! To close, thank you, again, to all of you who have contributed to OSAC’s current and future success. It has been an honor to work with you and watch the process develop. Thank you to the FSSB for your hard work and for tolerating me the last three years. It’s been an absolute pleasure to work alongside you. Finally, thank you to NIST OSAC Affairs for the untold amount of hours that you have devoted to the organization. The entire staff at OSAC Affairs is top notch and we could not have accomplished any of these things without you. Thank you, all! On behalf of NIST, OSAC Affairs and the broader forensic science community, congratulations to all of the OSAC members, affiliates and invited guests for the completion of OSAC’s third year. We mark our enormous undertaking to strengthen the documentary standards in the practice of forensic science by noting the eight standards currently on the OSAC Registry and more than two hundred others in the pipeline. We have posted more than 90 research needs on the OSAC website and we are assembling discipline-specific baseline documents to be posted on the subcommittee webpages. The members, affiliates and guests consist of a wide diversity of experts across the academic, research, statistics, metrology, legal and forensic science communities who have volunteered tens of thousands of hours to help review, create and debate the technical merit and fitness-for-purpose of scores of forensic science standards. I want to express my sincere appreciation to all who have contributed so much to the success of this organization. These extraordinary individuals provided wisdom, patience and leadership through some challenging times. Some of them will be staying on as committee members, others will be leaving OSAC, and in Melissa Gische’s case, she will become the new Physics/Pattern Interpretation Scientific Area Committee Chair. For those who will be staying on as OSAC members/chairs, I am delighted that we will continue to benefit from their experience and expertise. For those who are leaving, I know that farewell is not goodbye, and I hope we will see them again in another OSAC capacity sometime down the road. I wish them well in their next endeavors and feel fortunate to have enjoyed their company and benefitted from their outstanding leadership. I especially want to offer my personal gratitude to Jeremy Triplett, who as FSSB chair has invested three years of his life to nurturing and caring for OSAC. He is the consummate professional and his leadership and personal guidance has always been generous and caring. It was never about Jeremy. He has contributed more time and energy than any of us could have expected, and we are much stronger as a team than we could have ever have been without him. Thank you, Jeremy. This section describes SDO activities relevant to OSAC and the forensic science community. WK60382 - Guide for Forensic Audio Laboratory Setup and Maintenance is a new standard. Please visit the Notification of Standard Development and Coordination area of the AAFS Standards Board website to view the draft documents and to provide comments. Please send any questions to asb@aafs.org. Want to know the status of standards documents that are under consideration for the OSAC Registries? Please visit the Standards Under Consideration for the OSAC Registry page. The Center for Statistics and Applications in Forensic Evidence (CSAFE) partners with forensic investigators around the world to respond to the increased need for strong, quantitative assessments of evidence presented in court. Working alongside the National Institute of Standards and Technology through a cooperative agreement, CSAFE is a nationally recognized Center of Excellence in Forensic Sciences. A collaboration between Iowa State University, Carnegie Mellon University, University of Virginia, and University of California, Irvine, CSAFE brings together scientists, statisticians, forensic practitioners and other stakeholders focused on research that improves the scientific foundations of pattern and digital evidence analysis. The CSAFE community works to increase confidence in the accuracy of results of forensic investigations through new techniques in forensic data evaluation. The center has also developed partnerships with state and federal crime laboratories in a joint effort to create objective, repeatable standards and methods to reduce human related bias, risk and error. A central mission of CSAFE is to provide forensic science investigators, judges, lawyers, and law enforcement officials with the tools to decipher forensic science results through training and educational initiatives. CSAFE Center Wide Webinars represent a new learning opportunity for the greater forensic science community to increase proficiency in the statistical foundations of forensic evidence. The webinars highlight CSAFE’s approach to creating solutions to common problems in forensic science, allowing practitioners and members of the judicial community to discover how the center’s research applies to their everyday work. Thus far, CSAFE researchers and collaborators have presented on likelihood ratios for pattern evidence, a generative approach to forensic shoeprint recognition, algorithmic approaches to bullet matching, and case processing and human factors at crime laboratories. Each webinar focuses on improving the ability to interpret evidence analysis results and communicate findings effectively. Additional webinars on a variety of topics relevant to the diverse forensic science field have been scheduled for the upcoming year. Center Wide Webinars are hosted live, please contact CSAFE Communications and Outreach Coordinator Sarah Carraher at smc@iastate.edu to receive notifications of upcoming meetings and instructions on how to participate. Individuals unable to take part on the day of the event are able to view publicly available recordings of presentations and subsequent discussions. Archived webinars can be found on the CSAFE website in the Education Center. CSAFE encourages members of the forensic science community to share this educational opportunity with colleagues who would benefit from increased knowledge of statistical applications in pattern and digital evidence. Together, CSAFE researchers and forensic science professionals can improve the objective evaluation of evidence and contribute to the fair administration of justice. 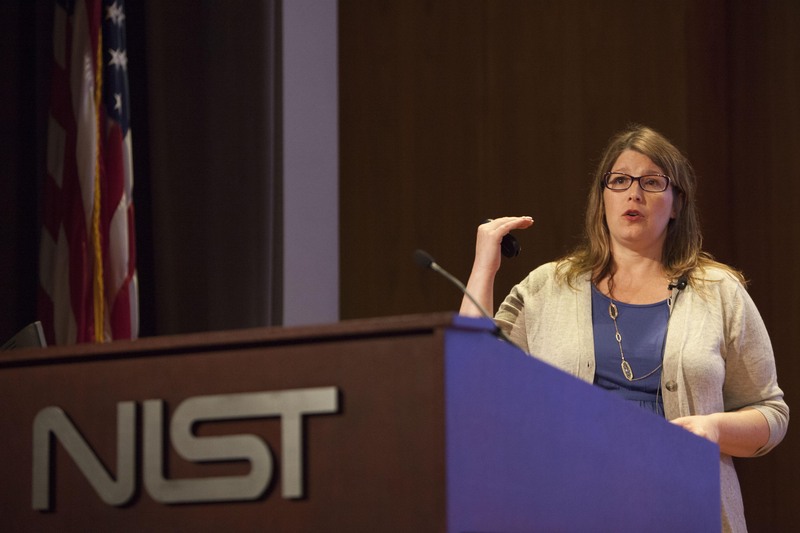 Lynn Garcia, general counsel for the Texas Forensic Science Commission, speaking at the 2017 International Error Management Symposium at NIST on July 25, 2017. At the International Forensic Science Error Management Symposium at NIST, experts spoke openly about a once taboo topic. When it comes to responding to error, Lynn Garcia, general counsel for the Texas Forensic Science Commission (pictured above), urged the forensic and legal communities to focus on accountability rather than blame.